The Day 6 bicycle is a semi-recumbent bike. 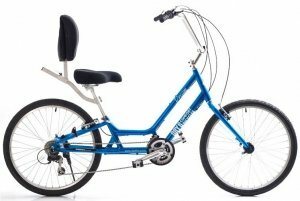 It is a new breed of bicycle that is a cross between a recumbent and a comfort bike. 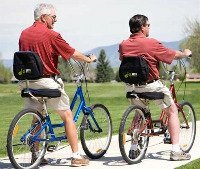 It was designed to meet the needs of riders that want to pedal with the maximum efficiency and still have a seat and riding position that offers the most comfort and back support. The original designer of the Day 6 bicycle is an avid bike rider with a bad back and this design enables him to ride in comfort. It also addresses the issue of sore butts and knees that plague some riders. Hear the Day 6 story from Al Brody who runs the Pikes Peak Coalition in Colorado Springs, Colorado. Al is a Day 6 owner and his comments apply to all Day 6 models. The wheelbase is a bit longer than a more conventional bike due to the pedal forward design. This helps to cushion the ride but does have some small effect on handling that I found to be insignificant. Other than the frame and the seat all of the components are standard and readily available. There is a choice of seats including the Velo which is a sportier more conventional seat, the Contour which is 11"wide with more padding, and the Bench seat which is a full 17" wide. All seats include a seat back that is fully adjustable horizontally and vertically. I honestly don't know how the seat could be more comfortable. What’s great about the Day6 bicycle is that you’re in this relaxed riding position, so there is no pressure on your hands or shoulders. When climbing a hill, I found that it to be easy, all I had to do was drop to an easy gear, push back against the seat back-rest and let the bike do its thing. Additional Day 6 features are.. The Day 6 bicycle has a step-through frame design for easy mounting and dismounting. The handlebars are raised to a more natural and comfortable level so there is no pressure on your hands or shoulders. The pedals on a Day 6 bike are shifted forward so the rider can get full leg extension at the bottom of the pedal stroke and still put both feet flat on the ground when stopped. It even offers, a choice of a ﻿seven or eight-speed internally geared rear hub and a single shifter for easy shifting, or, a conventional 24 speed with. The 7 or 8 speed is fine for smooth flat terrain but I would recommend the 24 speed for all-around versatility. Sizing is very simple. Since there are so many adjustments for the seating position, the Day Six only comes in 2 sizes. Just follow the manufacturer's recommendations for your height. A new addition to the Day 6 line is the Day 6 Samson which is a heavy duty bike designed to accommodate riders up to 400 lbs. All of the components have been beefed up and disc brakes added so plus size riders up to 3X can ride comfortably.